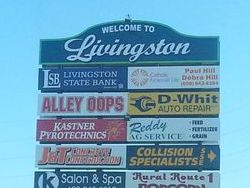 Livingston Wisconsin - Directory - Business & Misc. "With the good earth all around" & "Where the impossible happened!" Directory - Business & Misc. "The Only Bank You'll Ever Need"
Selling Quality Horses for 40+ Years! Serving Breakfast & Lunch...Daily Specials! * Thursday Lunch = Pasty!!! * Meat Paddles at 7pm Every Saturday from Fall to late Spring! Specializes in bulldozing, excavation, selling limestone rock, & selling black dirt. Cut, Color, Waxing, Nails, Tanning, etc. Livingston Co-Op & Oil, Co.
Fuel, Highway Diesel, Gasoline, etc. Gas, Diesel, Piccadilly Pizzas & Subs, Pop, Beer, Wine, Ice, Modest Grocery Aisle, and much more. * Pizza/Sub Deals Often Available!